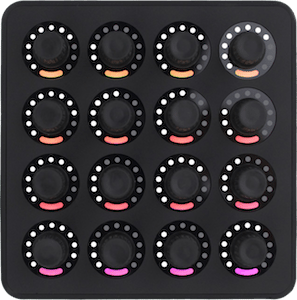 While it’s not the game-changer the Kontrol S4 was, the 2-channel Kontrol S2 delivers a formidable all-in-one Traktor Pro 2 package for budding digital DJs, as well as experienced controllerists. On one hand, it’s tempting to call the S2 the S4 Lite, and on the other hand, that’s not such a bad thing to be. Let’s check out this little brother and decide if it deserves a pat on the back or a vicious noogie. Same great sound quality as the Kontrol S4 and other NI audio interfaces. Added independent gain control for the booth outputs. Includes full version of Traktor Pro 2. MIDI mode for controlling other MIDI gear. USB bus power option. Designed to squeeze the most out of the reduced number of controls. Still no EQ kill switches. No auxiliary line input or footswitch input. No MIDI I/O. Can’t switch from Group to Single effects modes with the hardware. Decks C and D are available only as Sample Decks. No hardware controls for the loop recorder or FX Units 3 & 4. No dedicated Filter knob. Limited control over the Sample Decks. No price break for licensed Traktor Pro users. Shaving inches, weight, and $300 off the Kontrol S4 also means a significant slash in the utility of the Kontrol S2. 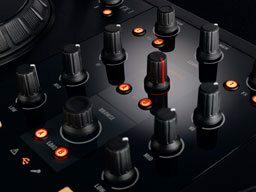 However, with two Track Decks, two Sample Decks, robust looping, killer effects, a high-quality 24/96 soundcard, and a full copy of Traktor Pro 2, the S2 could be the go-to choice for beginners, those switching to Traktor, or for those switching over from vinyl or DVS. 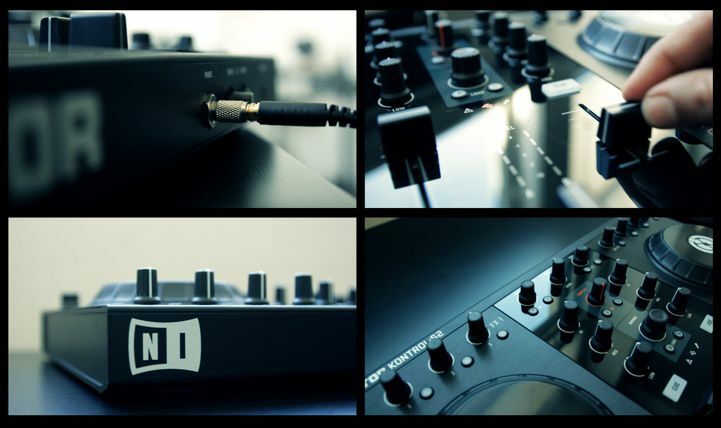 Last year, the Kontrol S4 made a splash in the DJ world as NI’s first four-deck controller. Its Traktor Pro S4 software set the groundwork for Traktor Pro 2’s Sample Decks and enhanced looping features. 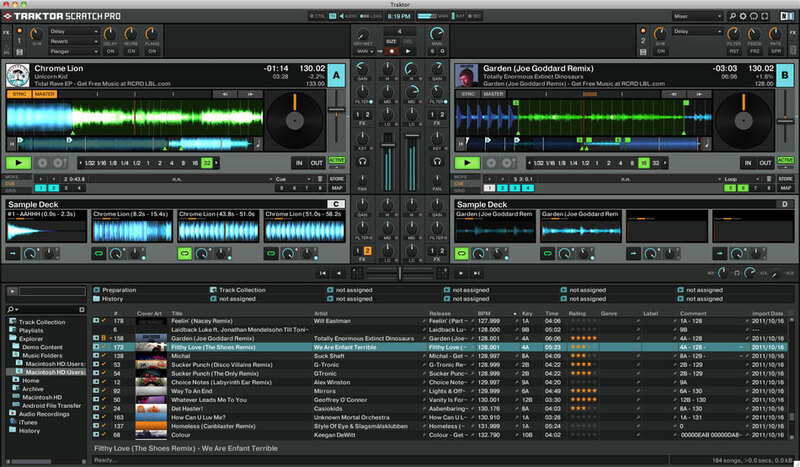 It broke ground, caused a lot of drooling, and made me personally switch to Traktor for good. Yet its burly size and $899 street price made some prospective buyers hit pause. It only weighed 7.5 pounds, but its 19.7 x 12.7 x 2-inch frame caused some problems for the backpack set. Enter the Kontrol S2, a more standard-size 2-channel controller that still attempts to wield the extraordinary power of Traktor Pro 2. At 6 pounds, it does feel significantly lighter than the S4, and its 17.2 x 11.5-inch dimensions add up to 198 square inches of tabletop footprint, compared to the S4’s 250 square inches. For that reduction, the S2 loses a whole lot more than just 2 channel strips. Gone also are the hardware Loop Recorder controls, dedicated filter knobs, a row of buttons and the display off of each deck’s sample/loop controls, and various other buttons, like toggles for Snap and Quantize modes. There are no Channel C and D audio inputs for incorporating DVS systems or MIDI I/O. But I’ll stop focusing on the negative and point out the real advantages of the S2, mainly the legacy technology passed down from the S4: the same tight hardware/software integration—featuring NI’s NHL communication protocol for 30 times more data transfer than MIDI, a solid build quality, smart, efficient control layout, an excellent 24-bit/96kHz soundcard, and of course Traktor Pro 2 software, which the S4’s design helped inform. It’s the same story here as on the S4—a story worth re-reading. The jog wheels’ top plates are touch-sensitive and switch-activated (like the CDJ jog wheels), giving you an accurate sense of timing. Their high-resolution gives you 1,000 points per revolution for excellent responsiveness. In short, these are small, but still nice scratching wheels—for a controller. If you live or die by scratching, you’re probably not making them your main instrument. You can also turn off scratching on the software preferences, if the thought of accidentally scratching a track during a show makes you wet yourself a little. 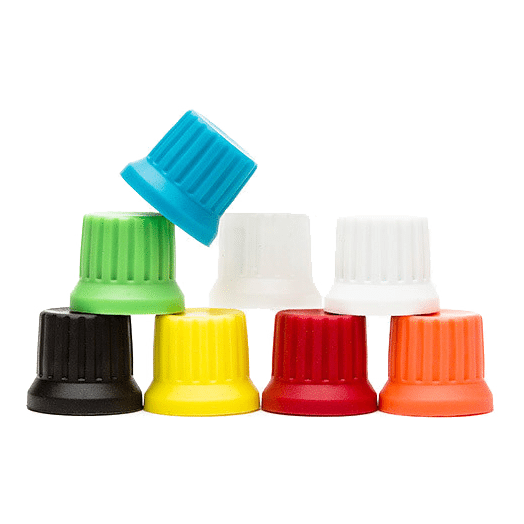 Rubberized, outer rims on the jog wheels have magnetic resistance and provide sensitive and precise tempo bending. 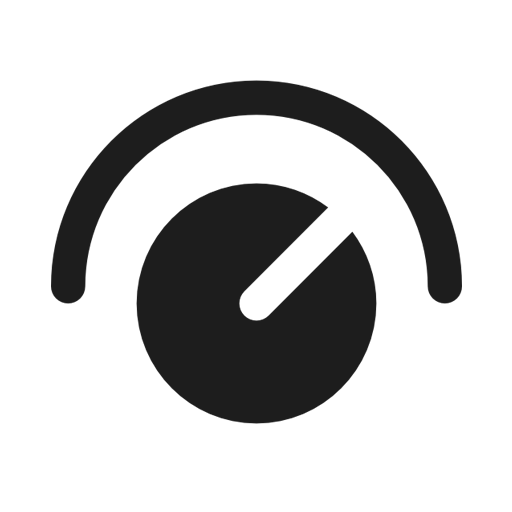 You can also press Shift and use a jog wheel to quickly scroll forward and backward within a track. The S2 crossfader feels exactly the same as on the S4—perfectly fine for most controllers, but again not made for battle DJs. Neither is it officially replaceable. The S2’s track browsing scheme is a bit scaled back, but should still keep your fingers off the computer. A single Browse push-encoder and Load A and B buttons do the trick. Turning the Browse encoder scrolls through tracks, and pushing it toggles the Browser Layout for a bigger look at your tracks. Shift + Browse encoder scrolls through playlists and folders on the left, and pushing opens those folders. The only big thing missing from the S4’s feature set is a way to quickly headphone-preview a track from the controller. For a while now, four-deck controllers have been the standard to keep up with the industry trends. We know a lot of you rockstars out there actually use 3-4 decks in your sets, and I’d like to say thank you for being awesome. More decks allow greater freedom and the potential for sicker sets (or worse trainwrecks). But to some extent, the four-deck trend is partially a way to keep the hardware and software iteration cycle chugging along and to justify replacing old models with the new during every specified fiscal quarter. When the market is fully saturated with four-deck controllers, something else will magically come along. With the S2, NI engineered a rather elegant compromise: Track Decks for Decks A and B, and Sample Decks for Decks C and D. This solution gives you a large part of the functionality that many people want out of third and fourth decks, without the bloat of the extra channel strips. Don’t get me wrong, I’d much rather have the full channel strip control over the Sample Decks like you have with the S4, but the S2 still gives you hardware control over the sample’s volume, playback and effects. Their channel strips, including dedicated filter, are intact in the software, so you could parse them out to another controller if necessary. Each Sample Deck has four sample slots for holding one-shots or loops of up to 32 beats. Decks C and D record from and sync to the tempo of Decks A and B respectively. You can load samples from the Track Collection (where sample from previous sessions are saved), create a loop and assign it to a Sample button, or create a new sample based on the current loop length by hitting an empty Sample button, either while the Track Deck is playing or stopped. You switch to Sample mode by hitting the A or B buttons in the Samples section of the S2 mixer. That toggles the Cue/Samples section of each deck to control the creation and playback of samples. The lone Samples knob controls the overall volume of all 8 sample slots, which is kind of a drag, but you do still have individual sample volume controls in the software. You can assign Deck C and D to FX Units 1 & 2 using Shift + FX 1 or FX 2 buttons underneath the channel Gain encoders. In the absence of the dedicated Filter knobs on the S4, you can control the filter of Decks A or B with Shift + Gain. That’s a less-than-ideal solution, because the Gain encoder is notched, resulting in filter sweeps of ±4 percent with every notch. The filter control for Decks C and D is software-only. With the S4, you could switch the full deck controls to C or D, giving you the ability to scratch or tempo bend the samples with the jog wheels, but that’s not the case with the S2. Also, we’re still waiting for the ability to save and then reload groups of 2-8 samples with group names, which would be a powerful tool for live remixing. Pretty please, NI? In case you were wondering, I was able to make Decks C and D into Track Decks in the software and load songs into them. However, the S2 does not output their audio. Oh yeah, about that microphone. You can plug a condenser mic (no phantom power available) into the 1/4-inch microphone input on the back panel. There’s also a Mic Gain control in the back, and a Mic Engage button on the front for activating the mic channel, which routes directly to the main output. You can use the mic channel whether the S2 is connected to a computer or not. When not in Sample Mode, the Cue/Samples sections are dedicated to setting and playing Hotcues, NI’s catch-all term for cue points and live loops. You get eight of them per track, but only four hardware buttons. Their LEDs light up blue when there’s a cue point stored there, or green for loops, which can be bounced to open Sample slots. 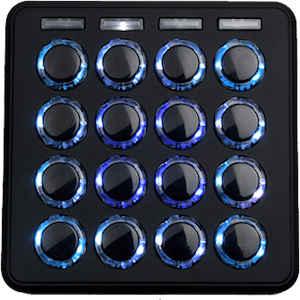 Like with the S4, we recommend using a good 16-button or pad grid like the Maschine or the MIDI Fighter with the S2 if you engage in spirited cue point juggling. The four cue buttons here aren’t particularly well spaced or constructed for being played like a percussion instrument. 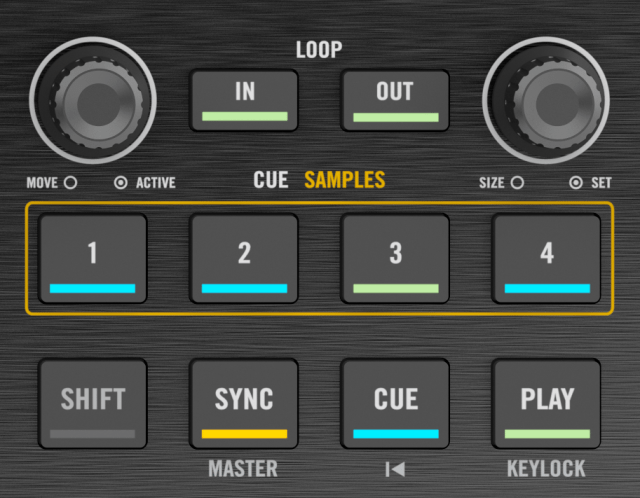 With fewer controls in the Cue/Samples section than the S4, the S2 makes judicious use of the Shift button. For instance, the Loop Move encoder moves the active loop or the track playhead forward or backward by the length of the current Loop size, or by 1-beat steps when Shift is held. If you don’t need the Loop In and Out buttons for creating loops of irregular size on the fly, the S2 Control Options in the Preferences let you switch them to Auto Loop. After that the Loop In and Out buttons will create new 4-beat or 8-beat loops, respectively or halve or double the length of active loops, respectively. Traktor’s effects have established their own legend and could be the subject of their own review; NI even sells a bundle of 12 of them as a separate product. 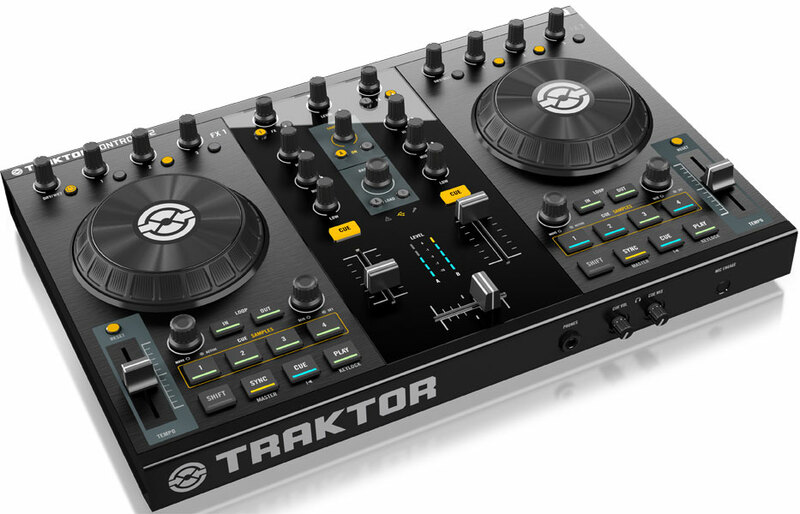 But since the S4 dropped, Traktor Pro 2 has added four new effects, bringing the total to 32. The new crop consists of Tape Delay, Ramp Delay, Bouncer and Auto Bouncer. The Bouncers give you a fun way to play with both controlled and uncontrolled re-pitchings and re-triggerings of segments of the incoming audio, and of course all of the effects sound great and offer tempo syncing. With the S2, you only get hardware control over FX Units 1 and 2. You can activate all four FX Units in the Preferences, but you’ll only have software control over Units 3 and 4. To my ears, the 24-bit/96-kHz audio interfaces of the Kontrol S2 and the Kontrol S4, which used the same components and technology as the well-regarded NI Audio 4 DJ, sound the same. What that means essentially is that you’re getting not just a usable sound card inside of a controller, but one that you’ll use happily. These soundcards hold their own against dedicated units that cost more than the S4 itself, only sacrificing the tiniest bit of warmth and definition under close scrutiny. Connections include two main outputs: balanced 1/4-inch TRS (that can route to XLR inputs with the right cables) and unbalanced RCA for booth outputs. In answer to user feedback, NI included a separate Gain Level on the back panel for the RCA booth outputs. The headphone section up front includes your 1/4-inch stereo headphone out, Cue Volume and Cue Mix knobs, both of which can push into the unit to stay out of the way. The S2 also shares the same high output levels as the S4, which adds up to plenty of gain from both mains and the headphones. Just as with the S4, the S2 comes with an AC Adapter with a set of international plugs. AC power, however, is optional. You can run the S2 off of a fully powered USB 2.0 port. If you go that route, the LEDs dim down to what I consider a nearly unusable level, unless in darkness, and the headphone level drops slightly. On the plus side, when I pulled the power cord out during use, the main audio output did not cut out at all, as it did for a couple of seconds with the S4. I could also hotplug the AC cord right back in with no disruption. 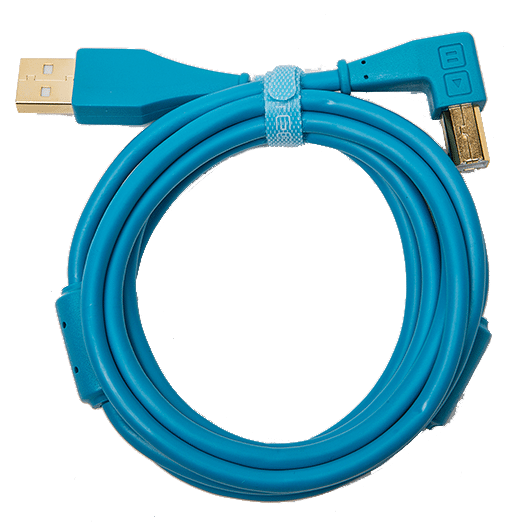 This means the USB cable is your life line, and the robust USB port holds the cable stubbornly in place, much more strongly than your average printer. Our very own “Army of me” made an excellent video showing a performance and look at the s2 in person! If you’ve ever been “downsized” from a job, you may have heard the conveniently trite cliché that “this is a chance to explore new opportunities”. Well, just as that is an attempt to polish a turd, it would be misleading and incorrect to say that the scaled back controls and capabilities on the 2-channel Kontrol S2 free you up to unleash your mixing creativity to an even greater extent than on the 4-channel Kontrol S4. Yes, in the hands of a master, you may never know the difference (see video below). After all, a Picasso is a Picasso whether it’s a pencil sketch or an oil painting. A creative DJ has plenty to work with here. 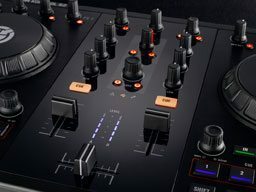 Any way you slice it, the heart of the operation is Traktor Pro 2; you just may need to touch the dreaded computer or use a supplementary controller to use everything the software offers. Most likely, DJs aren’t going to choose between the S4 or the S2 anyway. The S2 steps in as an excellent choice for Traktor Pro 2 users for whom the S4 was just too big and bulky, too overwhelming, or too expensive. 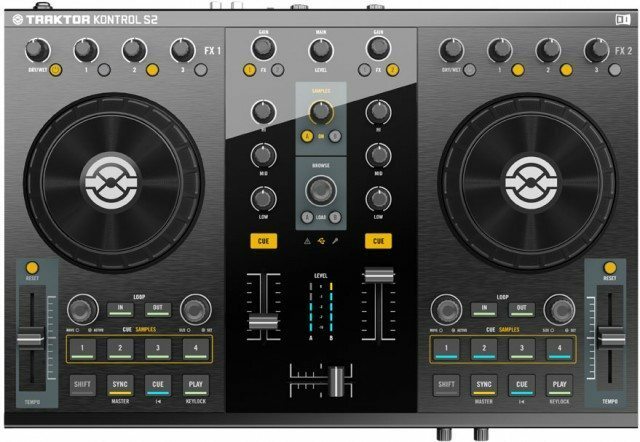 At $599 street, the S2 includes Traktor Pro 2 ($199 street on its own) and a high-quality audio interface ($99 street for the Traktor Audio 2), leaving about $300 on the price for just the controller. That’s a hands-down good buy if you don’t already own Traktor Pro. 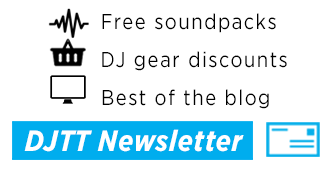 Unfortunately, there’s no discount on the price for licensed Traktor Pro or Pro 2 users. In the year or so since the Kontrol S4’s launch, the number of new controllers that have vied for your attention seems almost laughable when you think about how controllers themselves were being laughed at just a few years ago. In this now-crowded space, a new controller that’s a scaled-back version of a better controller seems about as exciting as another club instituting a dress code. Still, if the biggest fault of the S2 is that it’s not the S4, that makes it the second-best all-in-one controller for Traktor. How does that grab ya? Please let us know your thoughts, praises, criticisms, and what you’re wearing in the comments. ABOUT THE AUTHOR: Markkus Rovito is a journalist who’d rather be DJing, drumming, and singing, all of which he does as much as possible during work hours. The former Tech Editor for the defunct Remix Magazine has also written for Electronic Musician, Keyboard, Gearwire, Mac | Life, Maximum PC, and a bunch of stuff you can’t get on your iPad.